Now here is a mini van nobody would be embarrassed to drive! Imagine a world where gadets were powered by bio-batteries, you know – grab a mars bar and power your iPod for 6 hours by using some of the energy produced by your bodies? That is exactly what Gizmodo has written about! 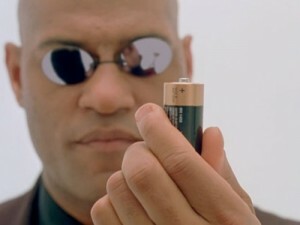 It turns out that the bio-batteries closest to reality at this time have a major problem with waste products. That waste is created as those particular batteries involve microbial yeast-based fuel cells that steal “some of the electrons produced when the yeast metabolizes glucose” in order to create a small current. While the entire process works just fine, the yeast cells are at risk unless the waste products are removed. We can’t exactly let the waste be dumped into the blood stream, so until there’s a some kind of cleaning process, the batteries are trouble as they either they die off or poison your bloodstream while trying to survive. I think this would be super cool but I hope we don’t end up like the Matrix! There was an exciting event today at Standard Auto Wreckers where a check for $10,000 was donated to a fantastic local ‘green’ charity, 10,000 trees! The funds came from OARA where members of the association have agreed to pay an extra $20 per vehicle they acquire though the Retire your Ride car recycling program. In the picture below you see (from left to right) Ken Gold, Raymond Cho, Colin Creasey and David Gold. Not only is the name cool but the car looks super freaky. I think it looks like you would see it in a cartoon or something. Can’t wait to see them on the road. 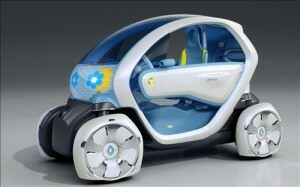 Renault has now confirmed that two models including Twizy ZE will go into production from end 2011. The production model will be similar to the concept model shown at the Auto Show and will be manufactured at its Valladolid plant in Spain. The Valladolid factory will also produce a new internal combustion engine in 2012, and a new fossil-fuel car in 2013. it is said that the production version will remain extremely close to the concept model that is powered by an electric motor that makes 15kW (20HP) and 70Nm of torque and drives the rear wheels. In 2012, an electric supermini will go into production at Renault’s Flins factory near Paris, and is predicted to account for two-thirds of the group’s electric vehicle sales in Europe. Flins will also be the site for the manufacture and recycling of electric vehicle batteries. The other two electric vehicles that Renault is planning to produce are the Fluence Z.E. compact sedan and the Kangoo Z.E. small van. A letter of intent has also been signed between the Renault-Nissan alliance, the Atomic Energy Commission and France’s Strategic Investment Fund to set up a French joint venture focused on EV battery advanced research, industrialization and recycling. Renault will use its battery plants in France, the UK and Portugal to supply EVs built around Europe, with the first batch set to come from the Flins site.